Medal, Gowing Bros Store, commemorative Queen Victoria, Diamond Jubilee, copper alloy, Sydney, 1897. 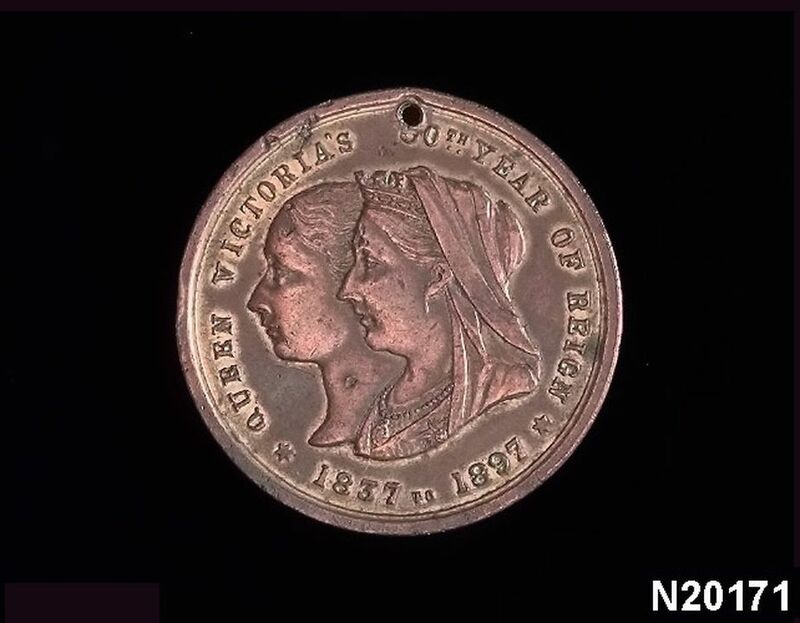 Medal coin, OBVERSE: two heads of Queen Victoria, one old, one young, surrounded by the legend “QUEEN VICTORIA’S 60TH YEAR OF REIGN. 1837 TO 1897”. REVERSE: A central stamp of a diamond around the Australian coat of arms with kangaroo, emu and rising sun. Legend around edge “PRESENTED BY GOWING BROTHERS SYDNEY”. Date in exergue, 1897. The top is pierced with a hole. Medal coin, OBVERSE: two heads of Queen Victoria, one old, one young, surrounded by the legend "QUEEN VICTORIA'S 60TH YEAR OF REIGN. 1837 TO 1897". REVERSE: A central stamp of a diamond around the Australian coat of arms with kangaroo, emu and rising sun. Legend around edge "PRESENTED BY GOWING BROTHERS SYDNEY". Date in exergue, 1897. The top is pierced with a hole. The token commemorated Queen Victoria's 60th year of reign. The token was used as a promotional item for Gowing Bros gentlemen's outfitters"